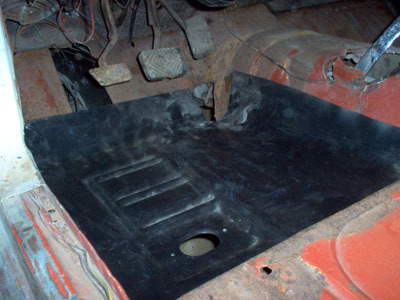 Floor pan replacement for this 1965 Mustang restoration, is one of the most common tasks faced by Classic Mustang owners and restorers. Like most classic cars, the Ford Mustang had great sheet metal and lousy rust proofing. 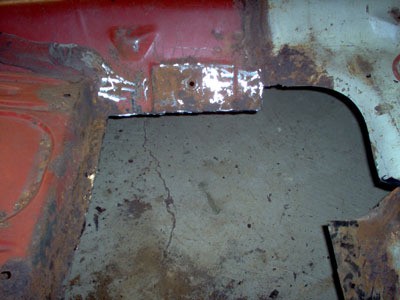 Ford seemed more intent on sealing spot weld seams for immediate water proofing of the interior than on preventing long term rust damage. If you own any other classic muscle cars, you'll also know the drill. 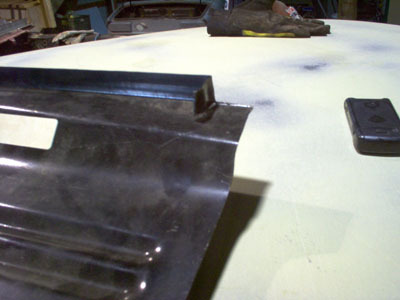 The Camaro, 55 Chevy, Chevelle, Charger and others all share the same fate at some time or other, a need for floor pan replacement. (And you thought the dealer installed undercoating was just an unnecessary profit taker)! 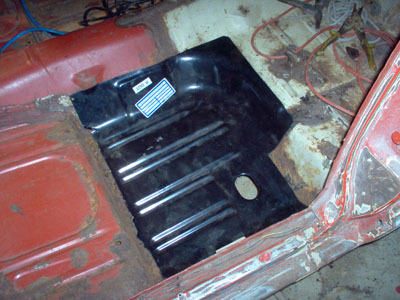 My 1965 Mustang has fared better than many pony cars, but there's still floor pan replacement in it's immediate future. While replacing the floor pans is time consuming and isn't particularly fun, it's not all that difficult to do. If you can't do your own welding, or can't find a friend to attach the pieces, you can at least do the prep work and save some cash. The rust in my floors, showed up in two ways. The easy part, were a few obvious rust outs. The second ones showed up when I sand blasted parts of the toe panels from the wheel well area. 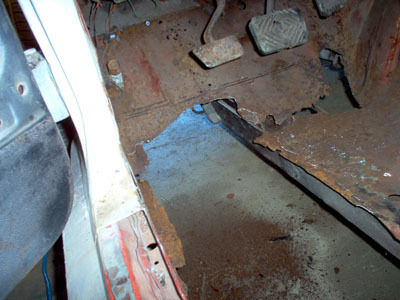 Whether you use a cut-off wheel, a saws-all or other tool to remove the old floor sheetmetal, it's important to first decide what gets removed and what stays. Just because you buy the sheetmetal floors as a unit, doesn't mean that you need to use all of them. For one thing, the replacement floors don't always fit like an OEM piece and you can still make a good looking floor pan replacement with a partial piece if you're careful. 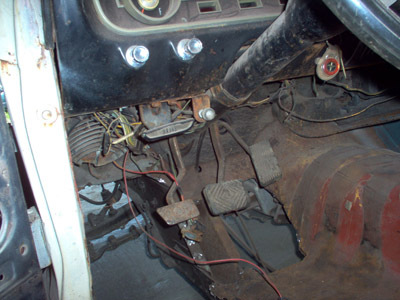 To complicate things, my 65 Mustang, had an ugly heavy gauge steel patch panel welded onto the driver's front floor area. underneath, was a chewed up, sharp edged mess, where the old metal had been removed. This resulted in some struggling to remove metal at the welds along the insides of the rockers. First came removing the patch panel and welds. Then came removing the jagged metal from the original floors and the lips still spot welded to the rockers. Warning: The driver's side toe panel near the gas pedal has the brake lines attached flush to it. So don't cut through without looking or you'll have a few more parts to be replaced! I decided to keep the good sheet metal between the transmission hump and the front crossmember for two reasons. The first, was because it kept the frame stiff with the old floors cut out. And secondly, because the original metal was in good shape and a heavier gauge than the panel replacing it. My seam will be directly on the frame rail flange, for an invisible fit and a very solid seam. Then, for a better fit and to make the seam below the seat platform fit tightly, I notched the rear side of the panel to allow it to slide below the platform and stay in place while I fitted the front edges of the replacement panel. The Seat platforms were in reasonably good shape, needing only a small patch on the forward edge. And floor pan replacement for the rear portion was a much simpler job. Again, it's a good idea to think about what goes and what stays. For a better appearance below the car, I chose to make the seams as high up the bend in the rear of the floor pan as possible. It's also the strongest part of that floor, with it's compound curve. And I did the opposite where the floor meets the transmission tunnel. In this area, I cut out the old floor below the machined bulge, where the seat belt backing plate is attached. This saves me having to get under the car, figure out where the old hole should have been and attach the backing plate to the new floor panel. It also allows me to have a very solid welded area around the backing plate. Now it's time to test fit the floor pans. The old adage "measure twice, cut once" is sound advice. Once all the pieces have been test fitted it's time to clean dress the areas with a wire wheel and grinder to remove old paint, rust and dirt and coat the areas with a cold galvanizing weld through primer. Note: DO NOT use panel bonding adhesives. While it's fast, these floors are structural and panel bonding materials are for non structural pieces. When that's done, it's time to weld them in place and then apply a sealer to the floor pan replacement joints to keep moisture out and at the same time, blend the repaired area with the original floors. Or find what you're looking for fast with the search box below.